From the kitchen, you will step down into the 400 plus square foot sun room with its brick floor, gas log fireplace, comfortable wrought iron furniture, a large flat screen TV (complete with a Netflix subscription and a Roku) and a table for dining. This room is a magnet for gathering and overlooks the patio and backyard. Stepping out to the brick patio with a comfortable brick and bluestone wall for seating, recliners and tables and chairs for Al fresco dining. Sipping your morning coffee, checking your emails and enjoying nature adds to the serenity and ambience. From the sunroom, you will step up into the formal dining room for eating or for card playing or puzzles. From the dining room you enter one of the four large common rooms. This room has a gas log fireplace, large bay window with window seat and plenty of room for many to gather and share memories or for one or two people to sneak away and enjoy some quiet time. While heading for the first floor bedrooms and baths you will pass the cozy den on your left with its queen sleep sofa and pocket doors. These doors allow for privacy if the need arises to use this room as a sixth bedroom. There is also a flat screen TV and plenty of books to read. There are four more rooms on the first floor. The first floor Master suite has its own bath, a queen bed, and twin trundle beds. It is adjacent to a very large study with gas fireplace and comfortable leather furniture, flat screen TV, and desk and printer for those who have to work. The study overlooks the second patio and the gardens at the rear of the home. This can be a family suite when combined with the Master or can be perfect for a couple wishing to have their own private space. The other two bedrooms on the first floor each have two twin beds and share a bath off of the hallway. There are pictures of all of these rooms with the listing. All five bedrooms plus the den and sunroom have ceiling fans in addition to central air. place for meditating. This room also contains a large flat screen TV complete with Roku and Netflix and two tables for game playing, puzzles or dining. To the right of the bridal staircase you will see the magnificent Red Room with it four poster bed, private sitting area (that is also a full-size sleep sofa). This room has its very own special black and white bath. The bath has a cast iron soaking tub and a rainforest shower. The second bedroom on this level (the Blue Room) has a queen size and a twin size bed. There is also ample closet space. There is a fourth bath in the hallway that services this bedroom as well as general guests. The easily accessible roof deck has reclining chairs for sunning and three tables that seat twelve. From here there are distant seasonal water views-sometimes as far as the Atlantic. There are also views of the Mill Pond and the drawbridge. The outside lot is professionally landscaped with a lush green lawn and a wide long expanse at the rear of the house for lawn games or just relaxing. The closest Beach, Oyster Pond, is just a 10-minute walk away and downtown is a 15-minute walk. There you will find many great restaurants and shops as well as a movie theater. Veterans Field, the home of the Chatham Anglers, is less than a mile away. The entrance to the Cape Cod Rail Trail for biking off of Crowell Road is about a mile away. This location is ideal--convenient yet quiet. Chatham is midway between the Sagamore Bridge and Provincetown. NOTE BENE: Rental prices do not include the 12.45% short term rental tax for any rental dates occurring on or after July 1, 2019. Check the reviews--renters LOVE this house and location. Visited Chatham for the first time in 1977--fell in love with the town and knew I would be back. After spending two and a half years looking found this very special house in a fabulous location close to the house we rented the year before. It was a three bedroom, 2 bath-since then we have done a 2,000 square foot addition adding 4 more rooms. Two more bedrooms, 2 more bathrooms and two more common rooms. This house holds SO many memories for my family and for the families of our many tenants. Both of my daughters were married in Chatham and had the wedding group at the house prior to. The house has hosted a 60th wedding anniversary, several 80th birthdays, many parents of the bride or groom pre wedding, and dozens of extended families gathering to create memories. The LOCATION! Quiet, private neighborhood, large lot with much room for outdoor activities. Add to that a 10 minute walk to Oyster Pond, a 15 minute walk to downtown. An after dinner walk down to Stage Harbor or a one mile bike ride to the Lighthouse Beach are added extras. The house has always been loved and it shows. LOCATION< LOCATION< LOCATION. 12 rooms--lots of space for families to spread out. Four full baths plus an outside shower. 475 square foot roof deck with water views. Three bedrooms on first floor, two on the second. Each master bedroom is en suite with designer baths. 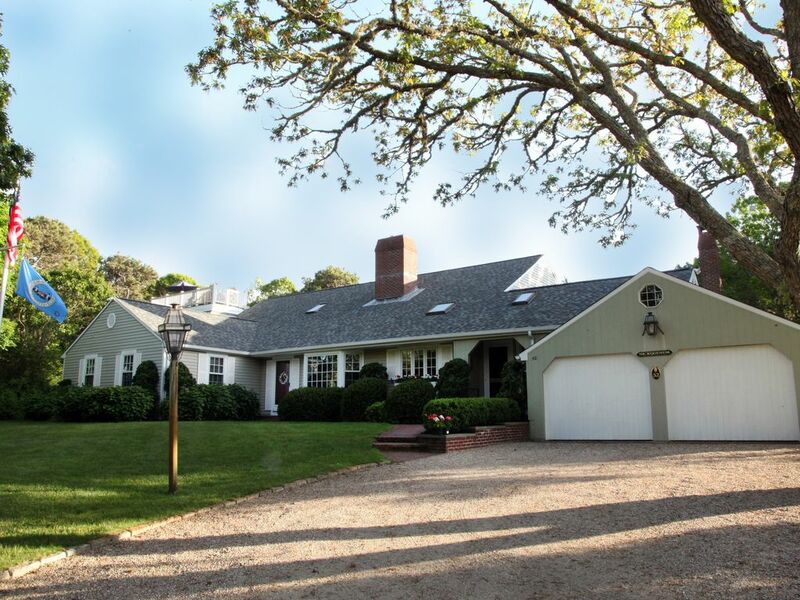 Chatham is a premier Cape Cod seaside fishing village. Beloved by many for generations there is something here for everyone. Chatham is midway between the Sagamore Bridge and Provincetown. Three queens, 7 twins, and 2 sleep sofas. 475 square ft mahogany roof deck with water views, 3 gas fireplaces, gas heat, ceiling fans, 5 skylights, outside 'after-swim' shower, basketball net, wireless internet access. Short walk to town and beach. We enjoyed visiting this property for an end of summer getaway. The listing photographs give an excellent preview of all of the charm that makes this property a special destination. We especially enjoyed the picturesque backyard with its lovely natural elements that attract beautiful butterflies and birds. Paul was easily accessible throughout our booking process and stay at the home. Wonderful house and great owners. WE HAD A GREAT TIME. WE WOULD HAVE LOVED TO STAY ANOTHER WEEK. We loved the spacious home for a large family group that included children. Being able to walk into town made it a great location and walking to a beach for the little ones was an extra perk. Very responsive landlord who was a pleasure to work with. We will definitely be returning. Beautiful and Spacious Rental-Excellent Location! Beautiful home located on a beautiful property in a very central locale! This house is much bigger than appears in photos and easily accommodated our party of 10 adults and 1 toddler. Plenty of sleeping options and ample room to spread out. Great spaces to be alone and curl up with a book or a Red Sox game or to convene in large groups both indoors and out. The furniture and decor were beautiful and comfortable and the house was spotless upon arrival. There were multiple gas grills for cooking... a kitchen stocked with plenty of dishes, silverware, glassware, pots and pans, and appliances.... plenty of parking... games... tv's... just about everything to make our family gathering a memorable, easy, comfortable stay! The owner, Paul, offered great customer service and was always at the other end of an email to answer questions. Close to Main Street and beaches, the Chatham Bars Inn and many restaurants and shops. An ideal location for stroller rides and walks. We would highly recommend this lovely home on a quiet private way. Thank you, Paul, and family! Beaches, restaurants, shopping, biking, walking. They are all in Chatham. Rates are subject to change until reservation is confirmed. In the event of cancellation the tenant is responsible for all rents due under the lease. If the premises are able to be re-rented at the same rate all rents paid will be refunded. Available for short term rentals year-round and for long weekends off season.